Editor's Note: This is the official list. If you find any cities that have passedresolutions that should be on this list, please send them in! 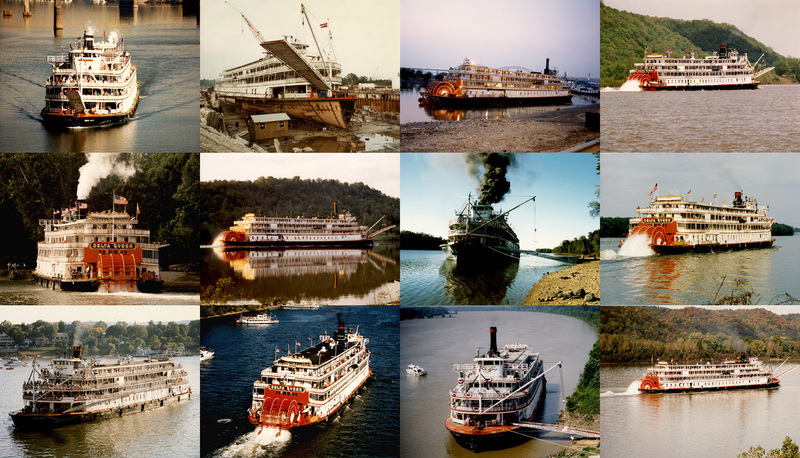 The folloing cities and organizations have passed Resolutions to save the Delta Queen:Ashland, KY *Borough of Sewickley, PA *Boyd County, KY (Ashland) *Bridgeport, AL *Burlington, IA *Catlettsburg, KY *Chattanooga, TN (Chamber of Commerce) *Cincinnati, OH *Clark County, IN *Clarksville, IN *Columbus, OH *Corydon, IN *Dubuque County Historical Society, IA *Dubuque, IA *East Liverpool, OH *Gallipolis, OH *Grandview, IN *Greenup, KY *Hastings, MN *Heritage Ohio (National Trust affiliate) *Howard Steamboat Museum *Ironton, OH *Kentucky House of Representatives *Keokuk, IA *Lockland, OH *Louisville, KY *Madison, IN *Marietta, OH *Maysville, KY *Natchez, MS *National Rivers Hall of Fame *National Mississippi River Museum & Aquarium *New Albany, IN *Ohio House of Representatives *Paducah, KY *Pittsburth, PA *Point Pleasant, WV *Pray for Peace Foundation *Red Wing, MN *St. Paul, MN *Sheffield, AL *Vanceburg, KY *Wabasha, MN *Click here to see a resolution (click the link, then scroll down). Please send information to Steamboats.com and we will post your notice here. Anothergood place to look: eBay. For other news (besides the Delta Queen) click here. Other Save the DQ sites:steamboats.org *save-the-delta-queen.org *savethedeltaqueen.com. 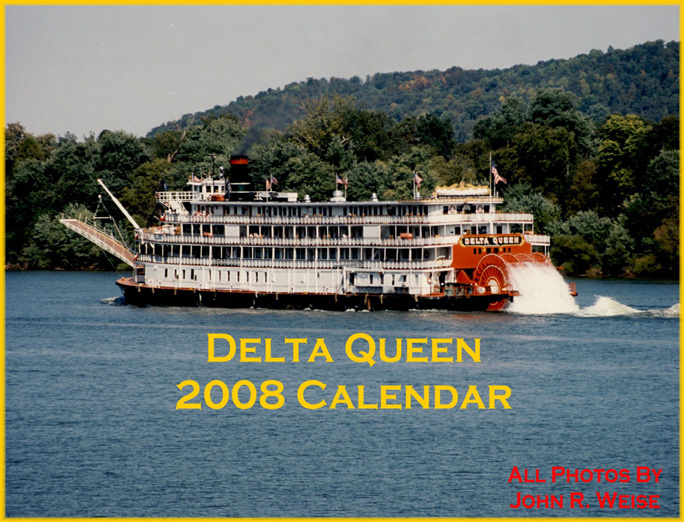 Bookmark this page and come back for Save the Delta Queen updates. . . .
2008 Steamboat Calendars - available now!! 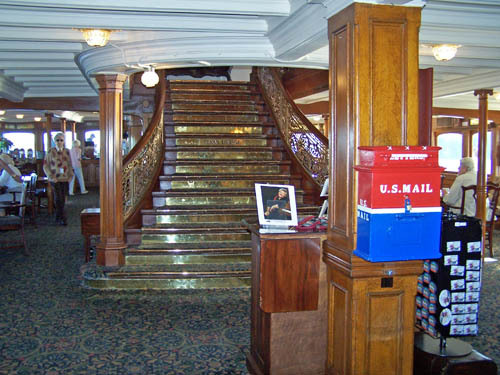 Choose from two designs - one is put out by the Historic Stermwheeler Preservation Society(HSPS), and the other is all photos of the Delta Queen. For ordering information, and to seethe calendar photos, click here. These are the NEW DELTA QUEEN COINS, just in time for Christmas. Coins in plastic container $12.50 each. Shipping in USA $2.50 for up to two coins. I will be happy to get a quote to other countries on shipping. There are only 125 of these coins availabale, and they will also be available on EBAY at a different price. If you want one or two of these collectors pieces, order now to insure you will get one. They will not last. In my opinion, "The Safety at Sea Act" means exactly that. SAFETY AT SEA,says it all. No where do you see "Safety on the Inland Waterways or RiverAct." The Delta Queen is a Riverboat, made for use on the Inland Waterways orRivers, and definitely NOT FOR OPEN SEA USE. This law should not apply tothe Delta Queen. The draft on the boat is 9.5 ft. If she were to sink, onalmost any of the Rivers, you would most likely never get your feet wet ifyou were standing on the Texas (2nd) deck. The boat is insured by Lloyds of London. They are VERY thorough in theirinvestigations of what they insure. I am sure they would never think ofinsuring the Delta Queen, if there were the smallest chance, someone couldbe hurt or killed on the boat, due to safety issues. The Delta Queen has amodern Radar System, most likely a modern GPS system as well, to instructthe Pilots where the Channel is located without looking for Buoys. We all need to contact people in California, Texas, New York and some of thelarger states, and urge them to contact their United States Congressman, andurge them to support HR3852. We need to explain the Delta Queen is NOT ASHIP, but a RIVERBOAT, and this law should not apply to the Delta Queen.There are Riverbanks on both sides of the boat, ALWAYS! 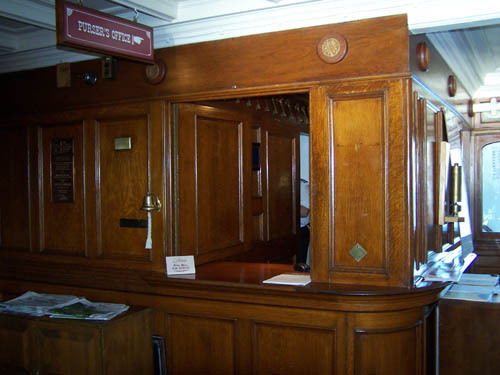 We all need to urgeour Cities and Towns, to pass Resolutions to Save a part of our AmericanHeritage, and Nationally recognized Historical Place, the last overnightpassenger Steamboat Delta Queen. The following River states should definitely be passing Resolutions, because the Delta Queen passes through their States. Alabama is one of the largest States the Delta Queen passes through, and not one Congressman is supporting HR3852.Other States that need to support this bill are: Wisconsin, Iowa, Illinois, Missouri, Arkansas, Okalahoma (Tulsa area), Texas (Galveston area), Louisiana, Mississippi, Kentucky, Indiana, Ohio, Tennessee, West Virginia,and Pennsylvania. 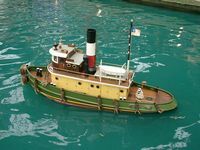 California should be in full support, because she came from that State, and played a great role in World War Two, as well as operating as a Passenger Boat on the Sacramento River. Passengers ride from California, New York, Texas, Florida, and many other States. They too should have Congressional support. We can win this battle and save the DELTA QUEEN IF WE ALL WORK. [Editor's Note: To see John Lewis' resolution click here and scroll down. "Another crisis may come to the Delta Queen. It makes little difference. Thestately steamboat will survive. Because it must. The river is unthinkablewithout a Delta Queen." Thanks for getting in touch with me about the Delta Queen. 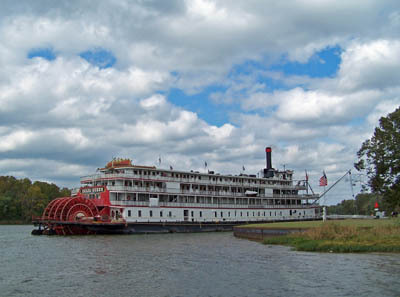 Actually, she has been a National Historic Landmark since 1989, and before that a National Historic Place, but fact alone is not enough to keep her in operation as a passenger-carrying riverboat. She needs an act of Congress to exempt her from a 1966 law that inadvertently lumped her in with seagoing vessels. At the moment we who are fighting to keep the boat running on the inland waterways face two obstacles: One is getting the bill through the Senate and the House of Representatives, over the objections of the two committee chairmen who must okay it before it goes before the members of both houses of Congress. The other is that the current owners, Ambassadors International, Inc. is in dire financial straits and is also unwilling or unable to lend an active hand in the effort. It's an uphill battle, but we refuse to give up without a fight. Again, many thanks for your support in the cause! Please send a holiday card to your two U.S. Senatorsand your U.S. Representative. 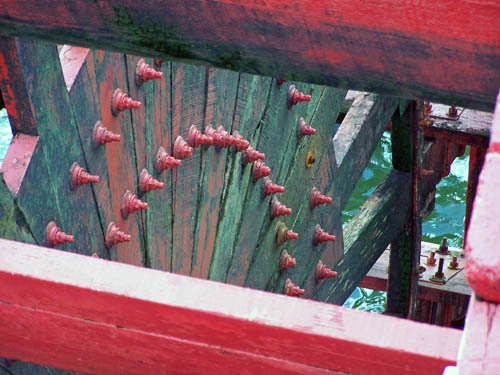 Pour out your heart about the boat and ask them to help saveit. A hand written card carries more weight than a fax, email, or phone call. Pleasetell us if you send a holiday to your elected officials and tell us if they write back. Hi - I have followed the Ohio River steamboats since I was a kid.I rode the Delta Queen with Fred Way, Jr. standing watch back in 1957. I lived in Huntington, W.Va.at the time and I was a senior in high school and our local river reporter James A. Wallen invited mefor the short ride from downtown Huntington (the site of the old Greene Line terminal) to Lock and Dam27 (I think). I watched the company go from one owner to another over a period of several years.Always, it was river people who had the best of intentions with a shoestring budget. Yet they kept theDQ running (somehow). Then came the sale to Coca Cola and we suddenly had a new steamboat designed fromthe inside out by the fellow who designed the QE2. When the owner in Chicago bought the line itlooked good for a while. And we all know where that went. A little in the mid 80's, the was a companyon the West Coast who operated small riverboats and the like. He, too, had big expansion plans. He keptbuying bigger and bigger vessels and soon owned a company called Exploration Cruise Lines (anyoneremember this line?) which in a matter of three or fours managed to go bankrupt. 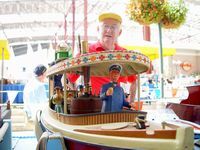 Imagine my surprisewhen about three years the same individual began building a huge sternwheeler for cruises to Alaska.That same individual Bob Giesdorf is the principal owner in Majestic America Cruise Line and you'reright it's only paper. Outsourcing is the number one priorities in these companies who have substantialdebt. Every month interest on that huge loan has to be paid, And remember, the first indication that acruise line is having problems is the lack of maintentance on the vessels, the second indication is theexperience level of the people whom they hire. Let's hope that v.ships does go into partnership withthem but remember that foreign companies cannot be the principal owner of an American vessel. Let'shope this thing goes right. My best, David Massie former senior editor Passenger Vessel News, columnistfor Steamboat Bill. 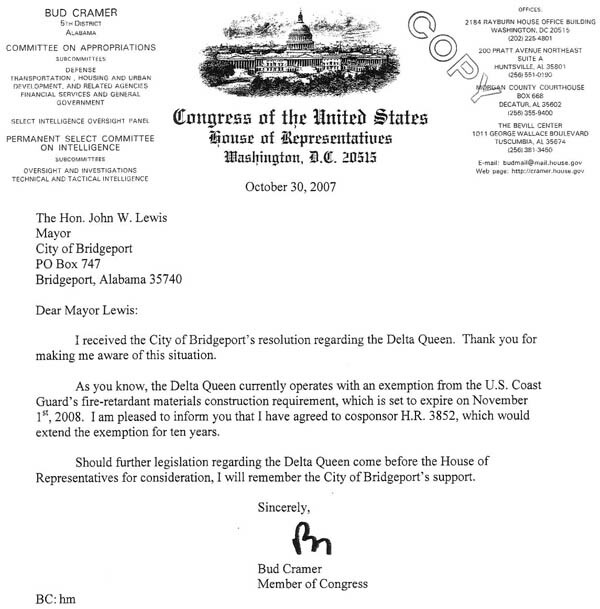 "...At your request, and because the Delta Queen has an exceptional safety record, I sent a letter with several of my colleagues to the House Transportation and Infrastructure Committee requesting that they include the Delta Queen exemption in a moving piece of legislation this year. Additionally, I am an original cosponsor of stand alone legislation, H.R. 3852, which will also provide an appropriate exemption for the Delta Queen. Please know that I will continue to work to get this exemption signed into law as soon as possible. I am pleased to support your position on this issue." I hadn't even mentioned that the Delta Queen has had the same insurer, Lloyds of London , since 1972. Thankfully some Congressmen have common sense. More Save the Delta Queen info., including links to articles, resolutions, other news -click here. Tired of waiting for whoever owns the Delta Queen to put out an Annual Calendar? 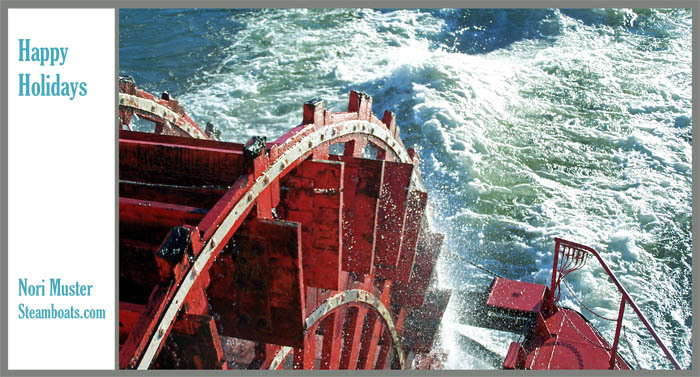 Think that 2008 might be the last year the Delta Queen ever steams? So was I - and decided to put out a 2008 Calendar with pictures of only the DQ. All my photos & going to have printed - already had three printed for myself, my son &Ruth Guenther. Looking for a unique and practicalholiday gift, or a great collectible? 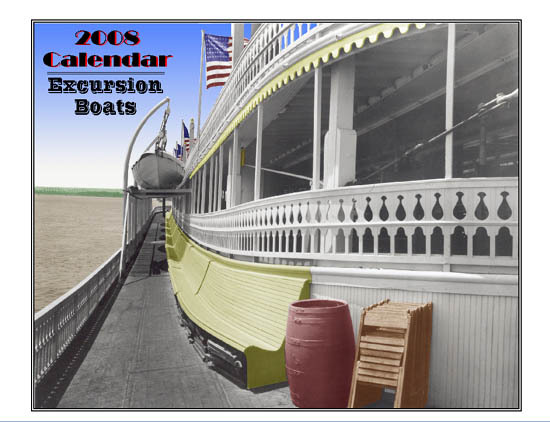 Our 2008 Steamboat Calendar featuring"Excursion Boats" is available now! 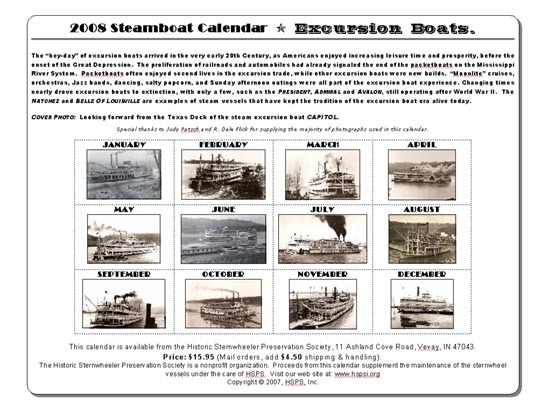 HSPS, Inc (a 501.c.3 non-profit) publishes a Steamboat calendareach year, with proceeds going toward maintenance of the 1923sternwheel towboat BARBARA H. Our 2008 calendar featuresearly photos of steam excursion boats. The calendar contains 13large photos printed on heavy card stock, suitable for framing. This is the Historic Sternwheeler Preservation Society's seventhcalendar, with all proceeds going toward the maintenance of thesternwheel towboat BARBARA H.
I wanted to let you know that we lost a valued member of the DQ community who offered an excellentmodel of both early & late versions of the Delta Queen. Mr. Dwight Hartman of Hartman Fiberglas passed away Monday afternoon after complications of a stroke.I believe he was 82 years of age & was still laying up hulls several months ago before his stroke.Since he had never progressed into the digital age & had no website, you can get a glimpse of hiswork & how his craft affected others here. http://www.rcgroups.com/forums/showthread.php?t=775105I'll put up a photo of his DQ once I scan several photos he sent me in letters I have. Sometime laternext year, I will get started on this project later next year once I get a few others out of the way. Good luck in your continuing efforts to save the DQ! I've sent several letters in as well as contactedfriends & family back home in WV to get some momentum going. Good to hear from you again. In case others can't get into that URL, I will post the photos ofDwight Hartman's models here. Would be happy to post more if you can get them. 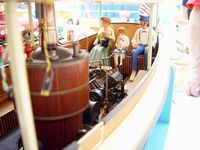 Editor's Note: Go to the Steamboats.com museum to see more models by the late Dwight Hartmanclick here. Editor's Note: See museum exhibit for latest news on The President - click here. I think there is a science that can be invoked to make this a reality. How can I assist as I work on my research .